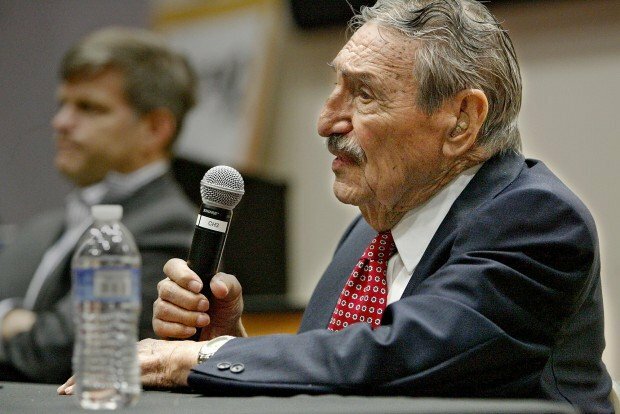 Raul Castro, a former Arizona governor and ambassador, was detained for nearly a half hour at a Border Patrol checkpoint on I-19. When family friend Anne Doan drove former Arizona Gov. Raul Castro up to the Border Patrol checkpoint on I-19 earlier this month, the agent had an unusual question. She asked if Castro had had a recent medical procedure, Doan said. The question led to a half-hour detention of the former governor that displayed the ability of Border Patrol agents to detect small doses of radiation. For Doan, it also showed the agents' inability to adequately accommodate frail people in the midsummer heat. "I'm not saying they're bad people," Doan said. "They were doing their job, but they weren't using their heads." A Border Patrol spokesman did not respond to questions about the incident Friday afternoon. The trip began late in the morning of June 12, with Doan driving Castro, a former ambassador to three countries as well as ex-governor, from his home in Nogales to a birthday lunch at the Mountain Oyster Club in Tucson. Castro turned 96 that day, and he tries to stay inside during the heat of the day, Doan said. They arrived at the checkpoint near Tubac a little before noon, and the agent immediately raised the medical question, Doan said. As it happened, Castro had received a medical procedure at Tucson Heart Hospital the previous day. Apparently, the procedure involved radiation, Castro said, because the agent had detected radiation coming from the vehicle Doan was driving. In a brief phone interview, Castro said the procedure followed up an earlier pacemaker procedure he had in March. Agents wear small radiation-detection devices on their belts, said Elyse Golob, executive director of the National Center for Border Security and Immigration at the University of Arizona. "It has a very limited range, so it goes off at the car" where radiation is detected, Golob said. The agent asked Doan to drive into the secondary inspection area, and she and Castro were directed to a shaded area beneath a canopy where a fan was blowing. At the time, the National Weather Service station at Nogales recorded a temperature of 97 degrees. Doan said she asked if Castro could sit in the air-conditioned car, but the agents said no. He sat in a chair beneath the canopy as Doan grew unhappy with the situation and told the agents of Castro's notable background. "I wish they would have let him sit in the air-conditioned car," Doan said. "It was too hot for him." The agents used a machine to scan Castro's body, asked him to fill out forms, then finally directed them back to the car. But before they got there, an agent remembered he needed to check Castro's identification, and he stopped him in the sun, Doan said. Flustered, the ex-governor dropped his identification card and the agents offered to pick it up, but Castro insisted on doing it himself. The agents "felt bad when he felt flustered," Doan said. U.S. officials started using the radiation detectors after the Sept. 11, 2001, terrorist attacks, said Scott Stewart, a vice president at Stratfor Global Intelligence. "False positives" are an issue, not just involving people who've had medical treatment but because the uranium in some areas of the West can set off detectors, he said. "They tried ramping this up right after 9/11. By 2005 or 2006, they had a lot of these things deployed," he said. Doan said she thinks it's wonderful the agents can detect radiation, but seeing the elderly ex-governor suffer in the heat bothered her. "I just sped out of there, and I did not stop till I got to Tucson."